Photo Daily Mail People flee from ash fall-out in August from the Popocatepetl volcano. Popocatepetl volcano is just 35 miles from Mexico City and only 20 miles from nearby city Puebla, meaning about 26million people would be affected by a disaster-scale eruption. 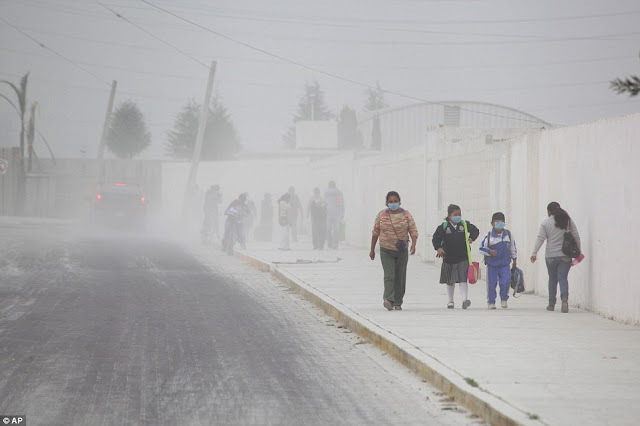 The "big one" is expected throwing tons of ash into the sky from the deadly Mexican volcano. The increased seismic activity this weekend could mean it is bubbling up for a devastating "big one" eruption - the likes of which have not been seen since 2000 when 41,000 people had to evacuate. Popocatepetl volcano entered a stage of continuous explosions and exhalations that emit incandescent material, the director of the National Center for Disaster Prevention (Cenapred), Carlos Valdes, informed today. He explained that the activity that the volcano presented during the early morning hours of this Friday is within the scenarios foreseen in the Yellow Phase 2 Volcano Traffic Light Alert and that the volcano maintains a fumarole to the west-northwest. The security restriction of 12 kilometres around the crater continues due to the danger of falling fragments, he said on his Twitter account. Valdes urged the inhabitants of nearby towns to collect the ashes emanated by the Popo, as they call him, and prevent it from going to the drainage.